As most people may know, Panduranga-पांडुरंग is another name of Vithoba, who is a Hindu god predominantly worshipped in the Indian states of Maharashtra, Karnataka, Goa, Telangana, Tamil Nadu and Andhra Pradesh. Vithoba is generally considered a manifestation of the god Vishnu or his avatar, Krishna. However, if we go by the meaning of the word, Panduranga, it loosely means 'the white god' in Sanskrit where 'Pandu' means whitish and 'ranga' means colour. So that translates Panduranga as God with white colour. Of course, Vithoba is well known as god with dark complexion and hence associating a white colour name (Panduranga) to Vithoba is bit confusing. As per Wikipedia, The Jain author-saint Hemachandra notes that Panduranga is also used as an epithet for the god Rudra-Shiva. My Question: is there any scripture reference exist where Shiva is referred or called by name Panduranga? William Crooke, a British orientalist has suggested that Panduranga is the Sanskrit-ised form of Pandaraga, which means ‘belonging to Pandaraga’. Pandaraga is said to be the old name of the city of Pandharpur. 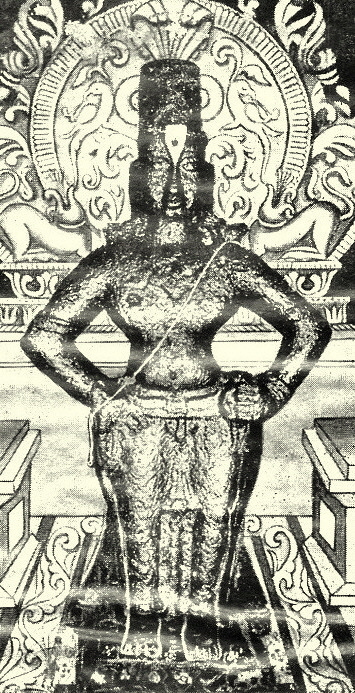 The Pandurangashtakam of Adi Shankara also proves that the image is that of Vishnu and not of Shiva through certain phrases like ‘One who holds the Lotus in his Navel for the residence of Brahma’, ‘Abode of Sri’, ‘Adorned with the Kaustubha Jewel’, ‘Great Protector’ which are all epithets of Vishnu. This shows that the worship of Panduranga as Vishnu was clearly established by the 8th century. But for your question about the name ‘Panduranga’, you’ll find the answer in the first paragraph. I am a Marathi devotee of Panduranga. We worship him as a Krishna avatara who have a story how he stood on Brick for his Bhakt Pundalik. There is nothing connecting link to Shiva. Not the answer you're looking for? Browse other questions tagged vishnu shiva name vitthal . What are the 28 yugas of Lord Vitthala? one possible meaning of name Ramchandra?